Arcanum: Of Steamworks and Magick Obscura is a 2001 role-playing video game developed by Troika Games and published by Sierra On-Line. It was released in North America and Europe in August 2001 for Microsoft Windows. Debuting at fourth position on NPD Intelect's best-seller list, it was Troika's first game and also their best-selling title with over 234,000 copies sold and with revenues of US$8.8 million. The story takes place on the continent of Arcanum, which is a fantasy setting that is in the process of an industrial revolution. The story begins with the crash of the zeppelin IFS Zephyr, of which the protagonist is the only survivor, which leads them throughout the land in search of answers. The game employs an isometric perspective and features an open game world where the protagonist can travel unhindered. Gameplay in Arcanum consists of traveling through the game world, visiting locations and interacting with the local inhabitants, typically in real-time. Occasionally, inhabitants will require the player's assistance in various tasks, which the player may choose to solve in order to acquire special items, experience points, or new followers. Many quests offer multiple solutions for the player, depending on their playing style, which may consist of combat, persuasion, thievery, or bribery. Ultimately, players will encounter hostile opponents (if such encounters are not avoided using stealth or diplomacy), in which case they and the player will engage in combat, which can be real-time or turn-based. The player (dwarf, center) in combat with the character Virgil against an Ailing Wolf. Three combat modes were included in the final release of the game: real-time, turn-based, and a faster version of turn-based. Arcanum's combat design has received some levels of criticism, with reviews usually stating that it is poorly balanced and frantic. The player's combat capabilities are in large part governed by the character's combat skills and weapons. Attacking is performed automatically by clicking on a hostile NPC provided that they are in range of the attack. Combat skills that the player character can choose from include melee weapons (with an optional back stabbing skill for stealth-oriented players), thrown weapons, archery, firearms, and a large variety of certain damage-inflicting spells from some schools of magic. Deciding whether or not to use violence in some parts of the game sometimes carries consequences for the player's party and its followers. Some AI-controlled followers the player has in the party will find their character's conduct morally objectionable, causing the player to lose reputation with some of the followers who may leave or even attack the player. Arcanum begins with the player creating their character, choosing from a large and unique variety of races, attributes, technological skills, magical aptitudes, and background traits, or the player may choose a predefined character. Over the course of the game, the character may improve their skills by gaining experience through completing quests or defeating opponents in combat. Every time the player gains a level, they can spend one character point to improve any attribute, weapon skill, technological discipline, school of magic, thievery skill, or social skill. Every fifth level, one additional character point is awarded for a total of 64 character points. The player can only control one character directly but may recruit additional followers during the game depending on their aptitudes and alignment. Player characters have the choice of specializing in a technological path which emphasizes constructing weapons, ammunition, and items from various components; a magical path which emphasizes spellcasting; or a neutral path, learning both magic and technology skills, which allows the most flexibility. The game uses a meter to show how biased towards magic or technology the player is; any character points spent on a technological discipline or skill move the aptitude meter towards the technology side and any points spent on spells move it towards the magical side. Character points spent on attributes or any other skills do not alter the aptitude meter. A high aptitude toward technology renders the character resistant or immune to magic (both harmful and beneficial) and also greatly decreases the character's ability to use magic effectively and limits the effectiveness of magical items. A high magical aptitude increases the effects of the character's magic and the power of magical items they equip, but technological items they equip will be subject to malfunctions, reflected in an increasingly higher chance of the character critically failing in combat, which can have devastating effects. The game, like its successors in the Neverwinter Nights series, features "modules"; the ability to create custom maps and missions using an editor included with the game. Already included with the game is Vormantown, and a number of official modules are also available. A screenshot from the game illustrating Arcanum's game world. Arcanum is the name of the fantasy world in which the game unfolds. It consists of a continental mainland and three islands. The world is inhabited by various races resembling those from the works of Tolkien, including humans, elves and half-elves, dwarves, gnomes, halflings, orcs, ogres, and various wildlife. Players can choose from humans, elves, dwarves, gnomes, halflings, and human hybrid races, including half-elves, half-orcs and half-ogres as playable races. The continent is divided between several different political entities. The Unified Kingdom is rapidly industrializing. Its two largest cities are Tarant and Ashbury, and it is the most technologically advanced kingdom. The Kingdom of Cumbria is a deteriorated kingdom, consisting of Dernholm and Black Root, and ruled by an old conservative king. The Kingdom of Arland, extending from Caladon to Roseborough, is a small but thriving monarchy west of the Stonewall range. The Glimmering Forest, the largest in Arcanum, is home to the elven city of Qintarra and the dark elven city of T'sen-Ang, and has been untouched by the technological advancements of the time. The Stonewall and Grey Mountain Ranges are home to the remaining dwarven clans: the Black Mountain Clan, the Stonecutter Clan, the Wheel Clan, and the Iron Clan. Many other minor settlements also exist, as well as containing ruins of past civilizations. The biggest of these is the ruins of Vendigroth, the most advanced city on Arcanum, which met a sudden and mysterious end. An important in-game dynamic is the dichotomy of magic and technology in the world. Technology is explained to function by using physical law to produce a desired result, e.g., a bolt of electricity from a Tesla Gun would arc through the most conductive path to its target, with some plated armors being more prone to electrical damage than others. Magic, on the other hand, is explained to manipulate physical law to make a lightning spell follow the shortest path to the target, instead of the natural path. The two are incompatible to the point that they overwhelm each other. Technological devices will become ineffective or even permanently inoperative in the presence of powerful magic and vice versa. Much of the population has chosen to embrace technology for its efficiency, accessibility, and permanent results, while the majority of elves, dark elves, and some humans half-elves continue to practice magic exclusively. This also affects interactions between different characters, as spells cast on technologists or firearms used against mages have a failure rate. Orcs and ogres are looked down upon as savage, feral peoples by Arcanum's civilized folk, who own virtually all the industry of the major population centers. There is a great enmity between elves and dwarfs, the former being naturally inclined towards magically-defined society, the latter being forerunners of the technology race—and many elves blame the dwarfs for the rise of human technology and concomitant waning of elfish political power. Scientists are unwelcome in magical societies like Qintarra or Tulla but will be respected if they are righteous and good folk. Conversely, a mage would be admitted onto a steam train only on the provision that he take a third-class seat on the last caboose, so as not to cause interference with the engine (despite there being no in-game mechanic by which even the powerful mages can affect it). Powerful mages may be denied transport altogether. Arcanum begins with a cut scene of the IFS Zephyr, a luxury zeppelin, on her maiden voyage from Caladon to Tarant. Two monoplanes, piloted by Half-Ogre bandits, close in on the craft and commence attack runs, succeeding in shooting it down. An old gnome who is a passenger aboard the Zephyr is now in his death throes under charred debris and tells the player to bring a silver ring to "the boy," and promptly dies. Being the only survivor of the crash, the main character is proclaimed as "The Living One," a holy reincarnate, by the only witness to the crash, Virgil. The story follows the player's path as he searches for the origin of the ring. Over the course of the game, the player uncovers more about the history of the continent, the motivation of the assassins who are trying to kill him, and the identity of the one threatening to end all life in the land. Arcanum is an example of a non-linear role-playing game. At various points throughout the game, players may take the story in different directions, sometimes permanently removing different paths of action. The game's central quest ultimately develops according to how players navigate its dichotomies, the most apparent being that of magic and technology. Many of the game's side quests allow for more than one solution depending on the player character's specializations and certain portions of the main quest can be solved more easily through dialogue than through combat. The game's magic/technology and good/evil alignments also influence what followers a character can attract throughout the game or how other NPCs will react to the player. The game is also notable for being possible to complete in everything from a completely pacifist to a completely violent way. The player can, technically, kill every person he meets and still complete the game, even the very first companion he meets at the start of the game - if the person was an important NPC with plot information to divulge, they will carry that information with them in the form of a journal or the like. Likewise, the player is technically able to avoid combat altogether from start to finish, and can defeat even the final boss of the game without using violence (although this requires certain conditions to be fulfilled to be possible to do). Most players will of course fall somewhere between these two extremes, but the possibility is unusual for a role-playing game and also something that remains popular with fans. Arcanum's public beta testing commenced in September 2000. It is the debut title of now-defunct development house Troika Games, which consisted of former Interplay Entertainment staff—most notably Tim Cain—responsible for 1997's critically acclaimed Fallout. On release, the game was found to be incompatible with some video cards, such as Voodoo2, and drivers such as nVidia's Detonator3. Furthermore, the game's copy protection software, SecuROM, caused system-component conflicts with particular brands of sound cards and CD-ROM drives. Such bugs, as well as some gameplay bugs, were one of the game's biggest criticisms. The latest official patch, 1.0.7.4 was released in October 2001. With the end of the official support several unofficial patches were produced by the game community to fix the many remaining problems and bugs. Arcanum's large, free-form world bears many similarities to Fallout with regards to the scarcity of towns, cities, or other locations of interest; however Arcanum's map is much larger and more diverse than Fallout's. The travel system has some similarities with The Elder Scrolls in that the world can be traveled across in-game (where occasionally the player runs into enemy groups), without the use of the world map, and that the game doesn't rush the player into pursuing the main quest. The game comes packaged with an editor, called WorldEdit, that allows players to create their own maps, campaigns, and NPCs. The program allows any game-world object to be input into existing and newly created environments via GUI menus. Editing can be done in either isometric or top-down views. Players have charge over the game's variables, such as the skill level required to pick a certain lock or the precise time that an electric light will turn on. Players are also able to create brand new objects via the scenery creator. In a 2000 interview with Nextgame.it, Tim Cain announced plans for an Arcanum sequel, but these plans would not come to pass—Troika Games filed for dissolution on September 30, 2005. In September 2006, one of Arcanum's lead programmers and co-founder of Troika, Leonard Boyarsky, divulged that the studio had originally commenced work on a sequel, going by the working title of Journey to the Centre of Arcanum, which would use Valve's Source Engine. Development was curtailed by disputes between Sierra and Valve, resulting ultimately in the project being shelved. Composed by Ben Houge, Arcanum's soundtrack features an unusual instrumentation by avoiding the predominantly symphonic orchestration common to RPG soundtracks. Instead, it is scored almost entirely for string quartet. The songs follow the conventional RPG soundtrack format: short, impressionistic vignettes which are looped in-game, with each area using different tunes, and alternative songs for combat. The soundtrack was produced by Ben Houge and Jeff Pobst, with Leonid Keylin on first violin, Kathy Stern on second violin, Vincent Comer on viola, Susan Williams on cello, Evan Buehler on marimba, and Ben Houge on djembe, rainstick and synthesiser. The game's soundtrack has been well received, and was listed amongst the 12 best video-game soundtracks of all time by Forbes in 2012. The soundtrack was not commercially released but is available for free download. Writing for GameSpot, Desslock reported that Arcanum "sold very well" in the United States during its initial weeks, but "faded" from the charts afterward. The game entered NPD Intelect's computer game sales rankings at #4 for the week ending August 25. It fluctuated between positions four and five for another two weeks, before exiting the weekly charts in the September 9–15 period. 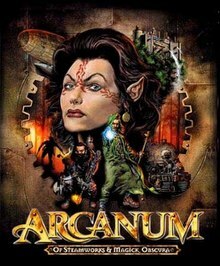 Arcanum was the United States' 11th-best-selling computer game for the month of September, and totaled domestic sales of 69,522 units by the first week of November. According to Chart-Track, Arcanum was also September's 10th-highest computer game seller in the United Kingdom. Remarking upon its chart position, Anthony Holden of PC Zone wrote that it was "good to see that a relatively minor RPG with solid gameplay values can shift a few units". Arcanum ultimately sold 234,000 copies and drew revenues of $8.8 million by February 2005. It was Troika Games' most commercially successful release by that date. The website GameDaily characterized its commercial performance as substandard, and as a contributing factor to the studio's closure in 2005. Arcanum received "generally favorable" reviews from critics, according to the review aggregation website Metacritic. The game also received praise from The Electric Playground, which awarded the game 9 out of 10 and calling it "the most diverse and open-ended RPG to date." Game Revolution praised the game, particularly the character creation, stating, “Whomever you are, the world treats you accordingly.” but also criticized the graphics. Game Informer rated the game as 6.75 out of 10, GamePro gave it 4 out of 5 and Mygamer awarded the game 8 out of 10. The editors of Computer Games Magazine named Arcanum the best role-playing game of 2001—tied with Wizardry 8—and presented it with their "Best Writing" award. They called Arcanum a "phenomenally well-written" title with an "incredibly creative" setting. It also won PC Gamer US's, RPG Vault's, The Electric Playground's and IGN's 2001 "Role-Playing Game of the Year" prizes, and was nominated in GameSpy's "PC RPG Game of the Year" and GameSpot's "Best Single-Player Role-Playing Game" and "Best Story" categories. PC Gamer's editors wrote, "Arcanum greatly exceeded our expectations, optimizing everything we hold dear about roleplaying on the computer." ^ Zovni; Unicorn B. Lynx; Jeanne (2001-08-21). "Game Credits for Arcanum: Of Steamworks & Magick Obscura". Retrieved 2006-10-16. ^ Walker, Trey (2001-09-06). "Arcanum debuts at number four". GameSpot. Retrieved 2009-07-06. ^ Tumeo, Antonino (2000-04-23). "Interview to Tim Cain". NextGame.it. Archived from the original on October 29, 2008. Retrieved 2009-07-06. ^ Kasavin, Greg (2001-08-21). "Arcanum Review". GameSpot. Retrieved 2009-07-11. ^ Staff (2008-02-03). "Point & Counterpoint 8: Best Overlooked RPG — Arcanum". CaffeinePowered. Retrieved 2009-07-11. ^ Parker, Sam (2000-05-17). "Arcanum: Of Steamworks & Magick Obscura Review". GameSpot. Retrieved 2009-07-11. ^ Metzler, Steve (2002-12-01). "Arcanum: Of Steamworks & Magick Obscura Review". Steve Metzler. Retrieved 2009-07-11. ^ Gestalt (2001-02-18). "Arcanum: Of Steamworks & Magick Obscura Preview". Eurogamer. Retrieved 2009-07-11. ^ Seamann, Simon (2001-08-24). "Arcanum Review". RPGamer. Archived from the original on 13 June 2009. Retrieved 2009-07-11. ^ "Vormantown Module, page 1 - Forum - GOG.com". www.gog.com. Retrieved 2016-07-20. ^ a b "The World of Arcanum". gamebanshee.com. Retrieved 2009-07-03. ^ a b c d e f "GameSpot review of Arcanum". GameSpot.com. Retrieved 2009-07-02. ^ "Arcanum Uber-Faq". terra-arcanum.com. Retrieved 2009-07-03. ^ Allen, Christopher (2001-08-22). "Arcanum: Of Steamworks & Magick Obscura Review". Allgame. Retrieved 2009-07-12. ^ Chimpan-A (2001-08-21). "Arcanum of Steamworks & Magic Obscura review by Sierra". Game Monkey Press. Retrieved 2009-07-12. ^ "Dimensions of Arcanum - Game Beta Testing". Dimensions of Arcanum. Archived from the original on 22 October 2006. Retrieved 2006-09-28. ^ "Dimensions of Arcanum - General Game FAQ". Dimensions of Arcanum. Archived from the original on 22 October 2006. Retrieved 2006-10-04. ^ a b c d "Arcanum of Steamworks & Magic Obscura review by Game Revolution". gamerevolution.com. Retrieved 2009-07-02. ^ "Unofficial Arcanum Patch v091225 Released". gamebanshee.com. 2009-12-27. Retrieved 2011-01-10. ^ Sines, Shawn (2008-04-20). "Unofficial Arcanum Patch Available". GameFront. Archived from the original on 2012-01-14. Retrieved 2016-08-19. ^ IGN Staff (2000-06-08). "Elder Scrolls III: Morrowind Interview". IGN. Archived from the original on 8 June 2007. Retrieved 2007-05-14. ^ "Arcanum: Behind the Scenes, pt. 5 - IGN.com". IGN.com. Retrieved 2009-07-02. ^ "Nextgame.it: Interview to Tim Cain - Intervista". Nextgame.it. Archived from the original on 2004-03-25. Retrieved 2006-10-06. ^ "Terra Arcanum". Journey to the Centre of Arcanum. Archived from the original on 15 October 2006. Retrieved 2006-10-18. ^ "Arcanum Soundtrack credits". sierrahelp.com. Retrieved 2009-07-03. ^ Kain, Erik (2012-09-08). "The Top 12 Video Game Soundtracks Of All Time". forbes.com. Retrieved 2014-01-28. ^ "Ben Houge, Arcanum Soundtrack". BenHouge.com. 2001-09-19. Retrieved 2009-10-19. ^ a b Desslock (November 23, 2001). "Desslock's Ramblings - Wizardry 8 Arrives, Kinda; RPG Sales Stats Updated". GameSpot. Archived from the original on November 24, 2001. ^ Walker, Trey (September 6, 2001). "Arcanum debuts at number four". GameSpot. Archived from the original on November 18, 2001. ^ Walker, Trey (September 21, 2001). "Diablo II rules August". GameSpot. Archived from the original on February 10, 2002. ^ Walker, Trey (September 12, 2001). "The Sims reclaims the lead". GameSpot. Archived from the original on February 3, 2002. ^ Walker, Trey (September 27, 2001). "Operation Flashpoint takes the lead". GameSpot. Archived from the original on February 3, 2002. ^ Holden, Anthony (November 2001). "The ChartTrack Top 10". PC Zone (108): 23. ^ Staff (February 25, 2005). "Troika Games Officially Closed". GameDaily. Archived from the original on April 5, 2005. ^ a b GameRankings Staff (2001-08-22). "GameRankings: Arcanum: Of Steamworks and Magick Obscura". GameRankings. Retrieved 2009-07-06. ^ a b Metacritic Staff (2001-08-21). "Metacritic: Arcanum: Of Steamworks and Magick Obscura". Metacritic. Retrieved 2009-07-06. ^ "Arcanum of Steamworks & Magic Obscura review by Gamespy". gamespy.com. Retrieved 2009-07-02. ^ a b c d e f Rgerbino (2001-08-30). "Arcanum: Of Steamworks and Magick Obscura Review". Gamezone. Archived from the original on 2009-04-23. Retrieved 2009-07-06. ^ a b c d e f g IGN Staff (2001-08-24). "Arcanum: Of Steamworks and Magick Obscura". IGN. Retrieved 2009-07-06. ^ Staff (2001-08-22). "Arcanum: Of Steamworks and Magick Obscura Reviews". GameRankings. Retrieved 2009-07-06. ^ Cavner, Brian. "Arcanum review by RPGFan". rpgfan.com. Retrieved 2009-07-02. ^ Jason (2001-08-24). "Arcanum: Of Steamworks and Magick Obscura Review". Greedy Productions Ltd. Retrieved 2009-07-06. ^ "Arcanum: Of Steamworks and Magick Obscura Reviews and Articles for PC". GameRankings. Retrieved 11 December 2013. ^ "Arcanum review at Mygamer.com". mygamer.com. Retrieved 2009-07-02. ^ Staff. "Blister Awards 2001". The Electric Playground. Archived from the original on October 13, 2003. ^ Staff (January 14, 2002). "2001 PC Game of the Year Awards". IGN. Archived from the original on February 22, 2002. ^ a b "The Eighth Annual PC Gamer Awards". PC Gamer US. 9 (3): 32, 33, 36, 36, 37, 40, 42. March 2002. ^ Staff (January 18, 2002). "The RPG Vault Awards 2001". RPG Vault. Archived from the original on October 6, 2007. ^ "Welcome to the GameSpy 2001 Game of the Year Awards!". GameSpy. Archived from the original on February 6, 2009. ^ GameSpot PC Staff. "GameSpot's Best and Worst PC Games of 2001". GameSpot. Archived from the original on February 4, 2002.